Hi, I cannot figure out how to fix this. It doesn't matter what font I use, or text size. Unstyled text is always in this weird outline style and extended beyond the text box. I cannot figure out what I did or how to get it back. If I select a pre-loaded style like Dimension 12pt everything is fine and I can alter size and font with no problem, but I can't make my own styles without this issue. Haven't been able to find any posts with this problem yet, any ideas? Try this: with nothing selected, go to the Font menu and set the Font; Style; Size, Etc. to your desired defaults. Subsequent new text creation should now be as you wish. To change the existing text, do the same things, but with the existing text selected. Thanks for the response. I have done this, but I still get the text in this weird outline (regardless of font chosen) and offset from the fill box. Post a file with a single misbehaving text block. Forum will take a look. When I open the file it is shown as an older version, and watermarked (no prob), but I don't know which version. So, for me to translate back please indicate in a post or, better, create a signature in your forum account settings. When this file first opened, I got a dialog to map the text (your font not available on my system). So it converted your text to Arial. It started as Swis721 BlkOul BT. This is an outline text. 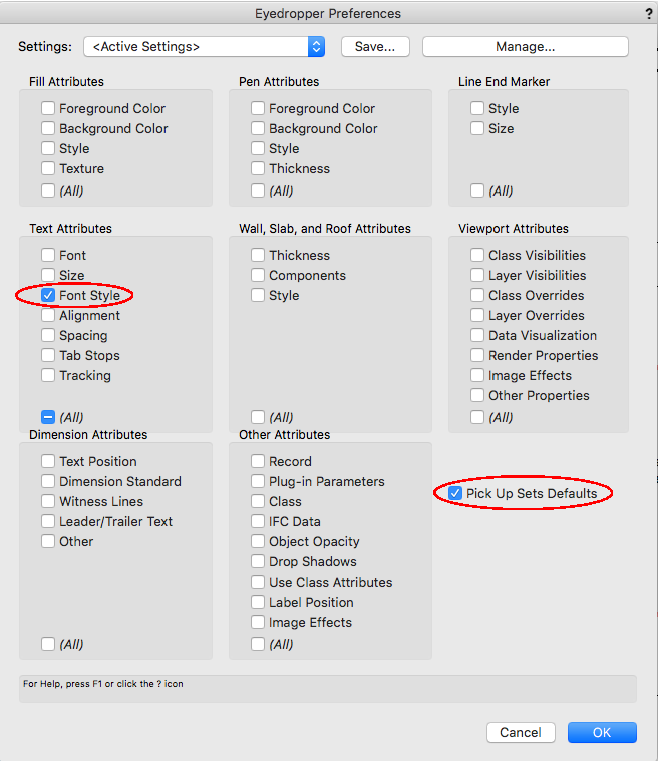 In my v2019, the text block OIP shows the options enabled for Shadow and Outline, hence the dbl outline in attached image. If I uncheck the options, the text displays as normal filled text. The v2019 file has only None and Dimension classes (same in your original?). The text is assigned to None class and None class text is assigned to Unstyled. So, at least in v2019, the mapped text is behaving as it should. Quit vwx. Then restart vwx. Open a new file (not from a template, just a blank file set for unstyled text). 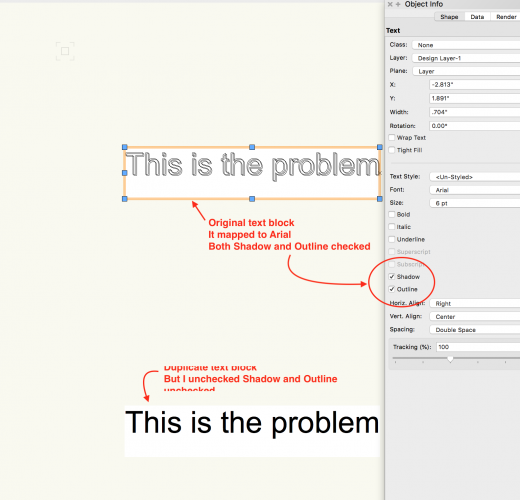 Create a text block in Arial or other common font with solid fill. If works, then make a new text block in Arial and convert to your Swis721 outline font. Then convert back. 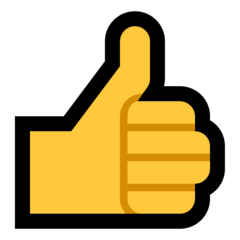 If things are working as expected, then the original file or that text block must be corrupt. Meanwhile, I hope others will open and test the file in your native version with your font. It doesn't matter what font I use but the file attached is Arial in a new blank doc. I do not have an option for shadow or outline. 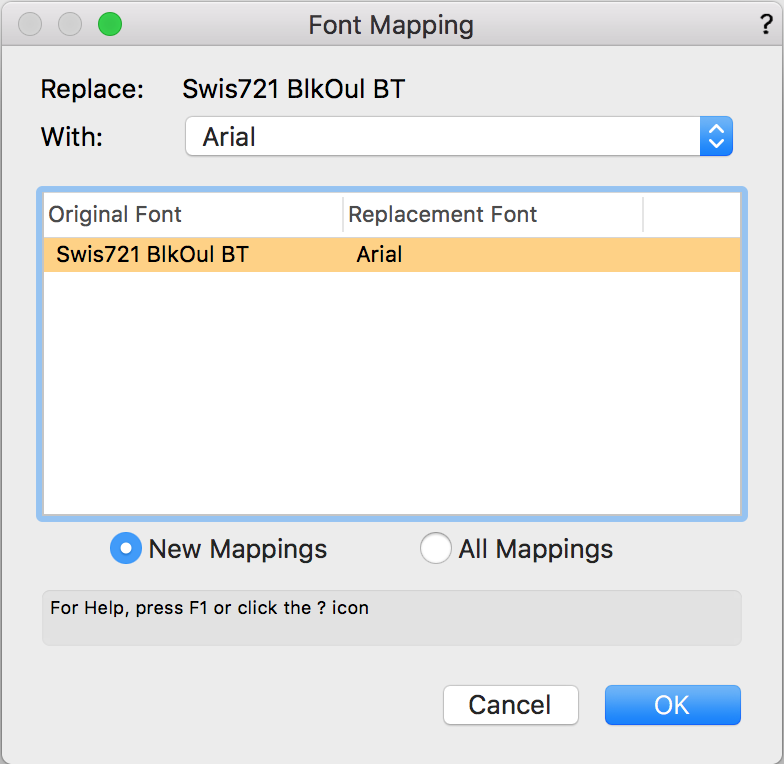 The OUTLINE and SHADOW TextStyles are available on the Mac, but not the PC, which is why they don't show in the OIP when you select a text block that has them set. Easy fix - With nothing selected, click on the 'Text > Font Style > Plain Text' menu item. There will be a check mark in front of 'Plain Text' the next time you open the menu. When you see the check mark in front of 'Plain Text', close the file (save if necessary, but not required) and QUIT Vectorworks. This will save this text setting as the default font style when you start a new VW session. If for any reason this doesn't work, then run this short VectorScript and QUIT VW as outlined above. That fixed it. Thank you so much. I have been banging my head for a while on this. I do not have an option for shadow or outline. You're welcome. Were you able to fix it with the Text Menu, or did you use the script? Just curious. Without the "Plain Text" checkbox in the OIP, there is no way to clear all TextStyle settings (like the hidden ones on the PC) in the OIP like you can when you use the TEXT menu above. The OIP and the TEXT menu items should be consistent. You can get there from here, but you have to use multiple UI items to do so. Not good. This option is controlled per-character on PC, so you can't apply super/subscript to a whole text object, but if you edit the text object and select all or some of the characters, you can use those formatting options. I suspect this is because super/sub display is generally relative to normal text. I think Kevin is referring to the Outline and Shadow options that are available on the Mac but not on the PC. They don't show in the OIP of PC. If a user gets a file that was edited on the Mac, these attributes could be set but wouldn't show in the PC's OIP. This adds a lot of confusion files edited on both platforms. I was planning on writing a VE for this this morning. Would you rather have me enter a bug instead? OH misunderstood, apologies. Yes then it would be a feature request to add Shadow and Outline as text effects on Windows. Looks like on Mac they're supported by the OS's font handling system but on Windows it isn't included by default and has to be added per-app (Word will allow it, but Notepad wont, as an example). One VE coming up (shortly). Since I'm getting a bunch of thumbs-up on this last post, I'm posting a copy of the Vectorworks Enhancement (VE) request I entered yesterday. Please feel free to comment on anything I missed. Anything relevant, I'll add it to my request. With﻿﻿﻿﻿﻿ a text object selected, the OIP on Windows does not show checkboxes for the Outline or Shadow style attributes. Outline and Shadow are attributes that can be assigned on the Mac, but not on the PC. 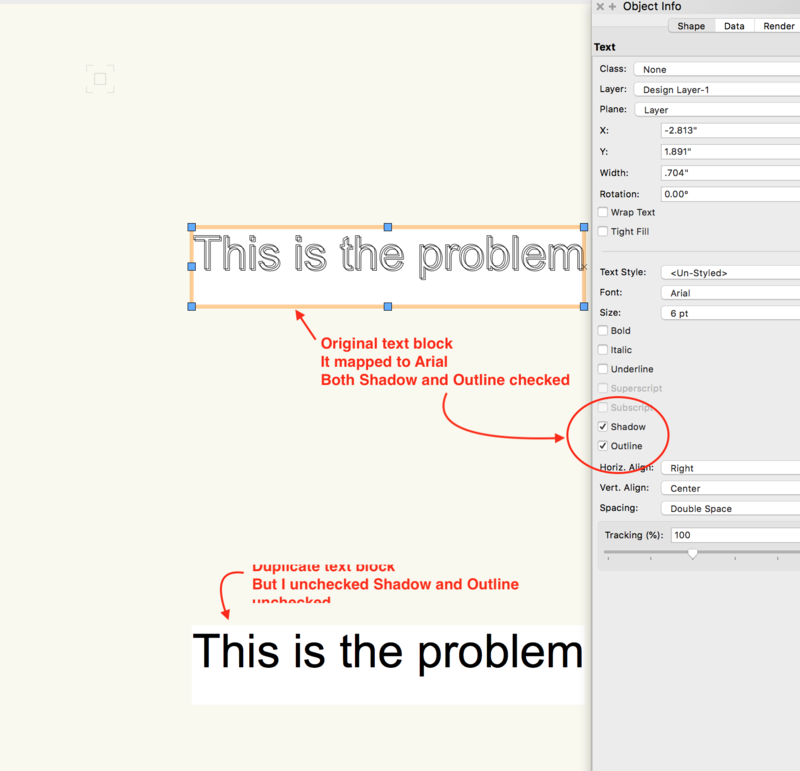 A problem exists where a text object can have the Outline or Shadow attributes applied on the Mac and then saved. The same file opened on a Windows version of VW will not indicate in the OIP these attributes are assigned, even though they still are. Searches for Plain Text will not find these objects. The Windows platform will attempt to show outlined text, but the user will be confused how to clear this effect since the OIP is missing these two attributes. 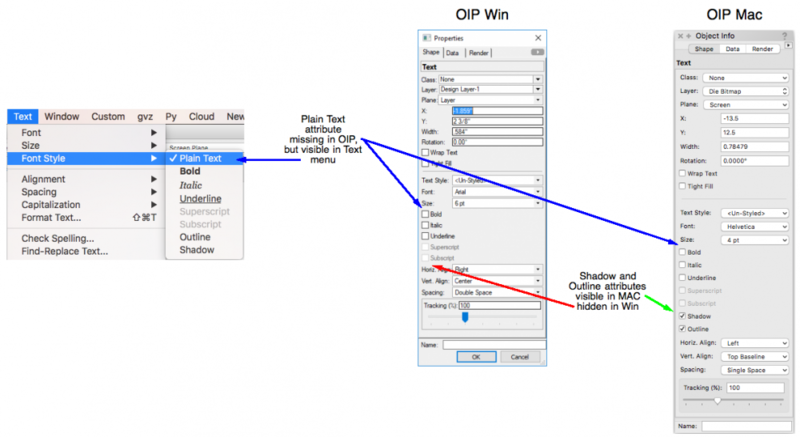 Solution, the Outline and Shadow attributes should be added to the OIP on Windows. Even if they always remain gray they would indicate when these attributes are set so users can be informed and act accordingly. I assume the Text>Font Style menu on Windows is also missing these two attributes, but I cannot check now. If so, it too should be updated. 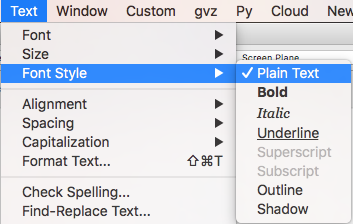 ADDITIONALLY, the "Plain Text" attribute that is present in the "TEXT>FONT STYLE" menu should be added to the OIP so users can clear all Font Style attributes with one click, including the inaccessible Outline and Shadow settings on Windows versions. This will benefit Windows users more than Mac users, but it will make the OIP consistent with the TEXT menu and across platforms. I would like to mention that I am a windows user and I ended up with this problem due to some voodoo key strokes I used. I did not open a file from a Mac. So there is some way for a windows user to do this to themselves. The problem would have been figured out much sooner had those boxes been visible even if grayed out. Thanks to Raymond for saving me from insanity. If you ever do figure out how to do this manually, please post back. I'd love to know how it can be done, too. On either platform, you can set these attributes with a script similar to the one I posted earlier that clears them. It is also possible to cut and paste text between documents that has one or both TextStyle flags set, but that would not affect the application setting, only the object's. However, the EyeDropper tool has a checkbox that "could" transfer those hidden attributes to be part of the text creation default settings. It's a long shot that you would fall into this rabbit hole, but not impossible. Honestly, I think you did it some other way, but I have no idea at the moment how. Again, please post back if you ever figure out how you got there.